This entry was posted on August 16, 2011 by Roc. Keemun is a historical reputed black tea in China. It was produced during Qing Dynasty at the Keemun County (Qi-men Xian) and surrounding areas at Anhui Province (An-hui Sheng). It was said that Keemun was produced as taking the inspiration of the famous black tea in Fujian, which was said to be the Lapsang Souchong. In the past, Keemun was mainly exported and highly appreciated by people in oversea, especially Britain and United State. The tea leaf is slender and fine, giving the sugary flavor with scent of sweet flowery note, with thick and mellow taste. These distinctive cup characteristics have gained much attention in the international tea profession. During year 1939-1940, the price of Keemun at the New York trade centre recorded the highest figure; it was the most expensive tea at that time and only upper class in the society could afford it. The Imperial and Noble Family used to treat it as a fashionable beverage. It was said that Keemun was presented to Queen Victoria as the Gift Tea during Her birthday. In US, it was the everyday-tea for the President of United State, Mr. Roosevelt and his spouse. Up to date, it is one of the three major black teas in the world, i.e., Darjeeling Tea from India and Uva Black Tea from Sri Lanka. The genuine cultivar is (Zhu-ye-zhong). There are many other cultivars being used to produce Keemun. However, different cultivars at other growing environment and difference kind of manufacturing know-how makes them different quality from the original Keemun that is produced from Qi-men area. The tea garden is scattered at the mountainous area which covered by forest. At this area, there is sufficient rainfall and the atmospheric temperature is lower with higher humidity. One of the essential factors for good black tea is mellow taste. This taste is originated from amino acid found in tea leaf, named as theanine. Young buds contains high level of theanine and when tea leaves receive sun light, theanine is converted to polyphenol such as catechins. At high elevation, the area is often covered by fog which blocks the direct sun light on tea leaves. Consequently, tea leaves are very rich in theanine as the conversion to polyphenol is not effectively taking place. This is the foundation for the Keemun with long-lasting fragrance and non-astringent but mellow taste. Keemun was made in year 1875 at Keemun County (Qi-men Xian) at Anhui Province (An-hui Sheng). During the early stage of Qing Dynasty, the Keemun County was famous in producing green tea. 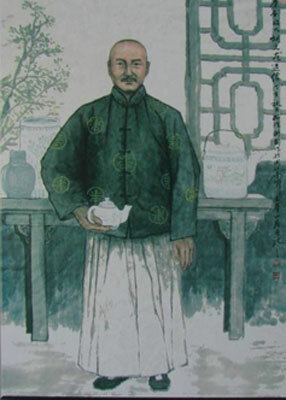 In the beginning of Qing Dynasty, the process of black tea was developed in Fujian Province. The increase popularity of black tea in oversea market caused the bloom of black tea production in Anhui Province. Due to its high profit margin, the tea merchant started to influence the farmer to involve in the production of black tea. It was mainly exported and Britain was one of its main importers besides France, US, German, etc. Keemun recorded the highest selling price at the wholesale market at New York City as compared to other famous black tea, e.g., India, Ceylon black tea. Keemun Black Tea gives fresh sweet sugary flavor with scent of flowery note; its long-lasting aromatic flavor had gained much attention. Up to date, it enjoys equal popularity and fame as Darjeeling Tea from India and Uva Black Tea from Sri Lanka. The Imperial and Noble Family used to treat it as a fashionable beverage and presented it as a Gift Tea during special occasion. Keemun Black Tea has been awarded for many times at international and domestic tea contest. 1987: During the 26th World Premium Food Product Contest held at Belgium, Keemun has won the gold prize. 1988: Keemun was awarded the gold prize during the 1st Food Expo in China.